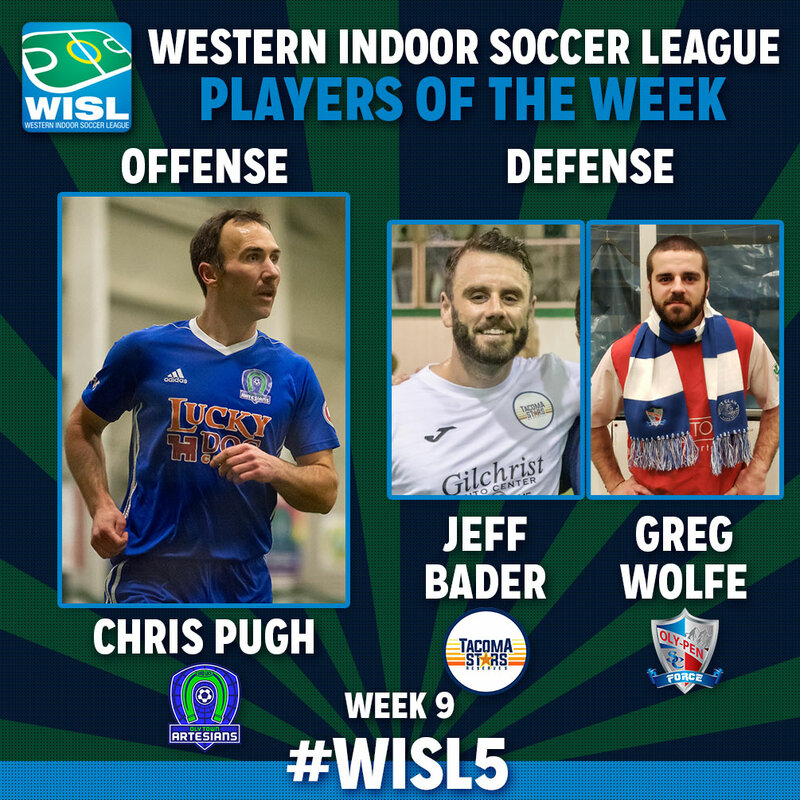 A hat trick by in a losing effort and two defenders that chipped in a pair of goals highlight the Western Indoor Soccer League’s week nine Players Of The Week. Oly Town’s Chris Pugh has been voted Offensive Player Of The Week and Oly-Pen’s Greg Wolfe and the Stars Reserves Jeff Bader tied for Defensive Player Of The Week in a vote by club operators and coaches. The Tacoma Stars Reserves traveled to Bellingham with an opportunity to end the United’s long home winning streak and clinch the top spot in the WISL’s regular season. Tacoma veteran Jeff Bader answered the call and scored twice, chipped in an assist and blocked five shots in the Stars Reserves’ dominating 8-3 win. The Evergreen State College alum was instrumental in stopping the Bellingham attack, and has been instrumental in leading Tacoma to a +59 goal differential this season with six goals and a solid, veteran presences on defense. Greg Wolfe also scored two goals from the back line in the Oly-Pen Force’s 12-7 win over the Oly Town Artesians. Another Evergreen State alum, Wolfe took on his former club on their home field for the first time and wreaked havoc against the Artesians. He scored once on his own with a strong blast, brought the pressure and forced Oly Town into an own goal, and drew a blue card in a crucial moment that effectively killed the Artesians’ momentum and cemented the victory for the Force. Wolfe has four goals in his first season back in the WISL since the 2015-2016 season. Yet another Evergreen State alum, Chris Pugh, scored a hat trick for the Oly Town Artesians in a losing effort. Down 7-1 midway through the third quarter, Pugh started a comeback attempt with two goals in a run that cut the Force’s lead to just two, 8-6, early in the fourth quarter and added a third goal a few minutes later. The 38 year-old forward is second on the squad with seven goals and continues to provide solid, veteran leadership to a young and inexperienced team that has struggled through a really tough season on the field. Two goalkeepers with Defensive POTW’s already this season, Mike Arguello and Trevor Davoren, also earned nominations in wins that had major playoff implications. The Stars Reserves’ Mark Lee, Snohomish’s Tony Clarke, and Oly-Pen’s Jaisen Zurfluh each earned nominations for Offensive POTW with two goal games.